Sometimes meat can taste savory and sometimes it can be on the sweeter side. This Crispy coconut chicken is on the sweeter side and a delicious change to our usual dinner routine. The crispy outside provides a wonderful texture and crunch to each bite. 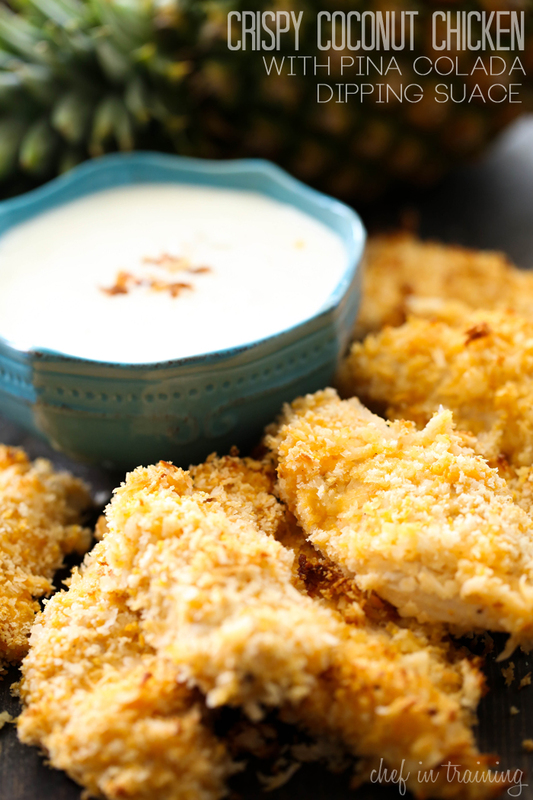 We paired it with a Pina Colada Dipping Sauce to complete the tropical flavor. It was a wonderful flavor addition. You can choose to dip it in whatever you would like. If you need an easy meal that is simple to make and the family will enjoy, give this one a try! This is an easy meal with a delicious tropical flavor! Combine ingredients for Marinade and pour into a ziplock bag. Place the 12 chicken tender in the ziplock bag, place in the fridge and marinate for at least 4 hours. Combine Chicken Coating ingredients in a large bowl. Remove chicken from bag and roll each strip in the coconut mixture and place on a foil lined cookie sheet that has been sprayed with cooking spray. Bake for about 20 minutes until the juices run clear. To make the pina colada dipping sauce, combine crushed pineapple, pina colada drink mix and sour cream in a small bowl. Dip crispy coconut chicken in sauce. This needs to happen here soon, it looks incredible. Love the flavors!!! Yum! Love that you included a dipping sauce to accentuate the tropical flavors in the chicken. Will definitely be making these for the family! This sounds awesome!! I'd like to make it for Sunday dinner, but I'm trying to think of something to make with it that would pair nicely - any suggestions? Nice recipe. Thanks very much. Looks great! were your coconut flakes sweetened? Love your recipes! I'm trying this one soon. What would you serve with it? Going to make this for the second time. I've paired it with coconut flavored rice (using th rest of the cocnut milk this way) and edamame. Comes out great. Thanks for the recipe!